This fossil appears to be a plant stalk but is in fact a marine animal. It is called the Plumulina plumaria of the Upper Devonian Period (approximately 380 million years ago). The fossil is on display at the New York State Museum in Albany, New York. Researchers determined this was not a plant because remnants of proteins were found and not cellulose. The museum display shows that this animal first appeared in the Hamilton Sea. It is similar to modern colonial soft corals and hydrozoans. 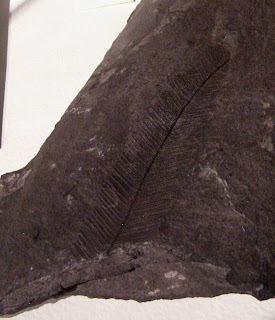 Fossil was found the Ithaca Formation of Tompkins County, New York. Thanks to Kenny for the picture and description.